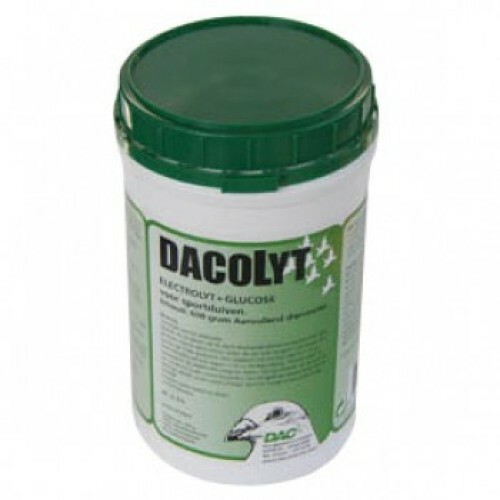 Dacolyt by DAC electrolyte and glucose is a treatment which monitors your birds acid and water balance. Dacolyt accelerates your pigeons recovery time after a long race or flight. It is to be given as instructed in the dosage and feeding instructions to bring your birds back to top condition in a short period of time. When pigeons return home from their flights they need rehydrating and providing the correct salts and glucose to return back to correct levels. • STEP 1: Once returning give the birds fresh water with no Dacolyt. • STEP 2: After 2 hours give them fresh water again but this time with Dacolyt at the following dose:- 25g of Dacolyt (1 Tablespoonful) in 2 litres of drinking water. Have it at their disposal for 24 hours. • STEP 3: After 24 hours remove and carry on providing fresh clean water. Store dry, out of reach of direct sunlight at a temperature between 0 and 30c.